Follow The Released Of “Fine Girl” Last Year (2018) Which Gone Viral Via Massive Turn Up By Fans And Family For The Good Vibes Of The Song. The Steady Rising Afro Pop Superstar Singer, Raphael Omitoyin Hailed From South West, Federal Republic Of Nigeria. 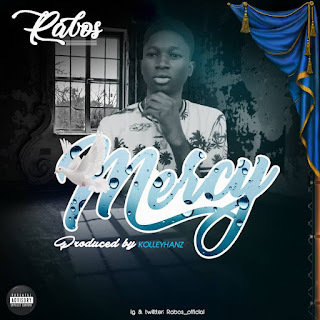 The Vocalist, Recording And Performing Artiste, Professionally Know As “Rabos” Turn On This Year(2019) With An Amazing, Hopefully Hustler’s Anthem Track, Which Entitled “Mercy”. Mercy Is Everybody’s Song As It Filled With Motivational Dancehall Tone, God’s Prayer Requests To All Hustlers And Mankind. No Doubt, We Can Vividly Tell You This Song Gonna Be World Classics Choosen Song, (Hit! ).